The Turleys launched “Catherine Cares” after their daughter died in 2014. A Missouri couple is healing parents from heartbreak while honoring their own newborn who they lost more than two years ago. 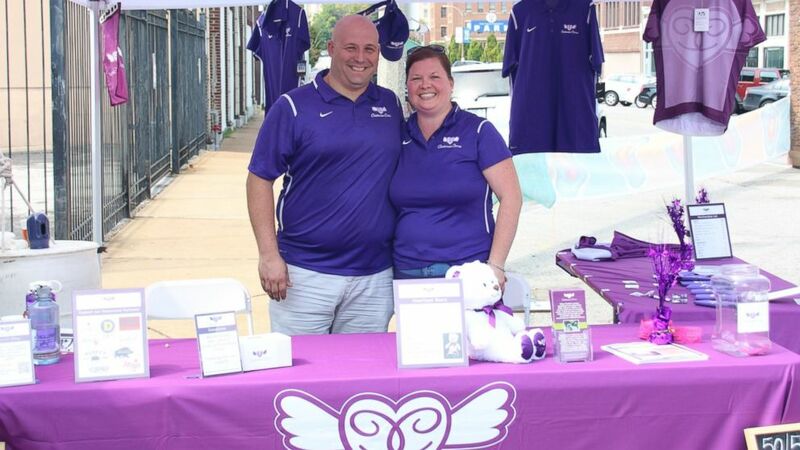 Wayne and Lauren Turley of St. Louis, Missouri, launched "Catherine Cares" after their daughter Catherine died one hour after birth. Now, they're sending heartbeat bears to families of children who receive a devastating prenatal diagnosis. "The hope is that these babies survive, of course," Lauren Turley, a resident of St. Louis told ABC News today. "The one thing we have in common is that heartache. We want people to understand that we're here. We just want people to know they're not alone. There's hope. Regardless of the outcome of the diagnosis, you will be able to smile again." After her 20 week ultrasound, the Turleys' unborn daughter was diagnosed with Trisomy 18 -- a condition that causes severe health complications due to an extra chromosome 18. "We made the diagnosis through amniocentesis -- a procedure that is performed during pregnancy that involves taking a sample of the amniotic fluid and performing genetic analysis," Laura Vricella, the Turleys' obstetrician at St. Louis University Hospital and St. Mary's Health Center, told ABC News. "The Turleys are a very special couple. I felt privileged to be able to take care of Lauren during this difficult time. They really turned their loss of Catherine into a continuous gift to other families who go through difficult times during pregnancies. They've helped many other families whom I've cared for." On Dec. 30, 2014, baby Catherine was born 2 pounds, 5 ounces. She had heart and brain deformities and only lived for one hour, her father Wayne Turley told ABC News. "While Lauren was pregnant with Catherine, after the initial diagnosis and confirmation of Trisomy 18, we got our arms around what lied ahead of us and we were sick of being sad, planning her funeral. We started thinking about what others had done for us and how it helped. We came up with the concept of 'Catherine Cares.'" (Wayne and Lauren Turley) Wayne and Lauren Turley of St. Louis, Missouri, who launched "Catherine Cares," are seen in at Urban Chestnut Brewing Company's Oktoberfest celebration in September 2016. Through "Catherine Cares," Lauren and Wayne hold fundraising events to go towards heartbeat bears from Build-a-Bear. Each one includes a device so parents can record their child's heartbeat while in the womb. "With our [older] daughter Madeline, we did the same thing, we recorded heartbeat in utero and put it inside a Build-A-Bear," Wayne said. "Once we got the diagnosis of Catherine, the idea of having that bear and having her heartbeat took on a whole different meaning." On Feb. 9, for their first deliveries, the Turleys distributed 24 bears and 50 recorders to both St. Louis Children's Hospital and Cardinal Glennon Children's Hospital in St. Louis. "Catherine Cares" is also partnered with Mercy Hospital, Missouri Baptist Hospital and works with local grade schools including St. Peter's Catholic School in Kirkwood, and William Holiday Elementary School in Fairview Heights. "The heartbeat of child lost, sometimes even before birth, is a reminder for loved ones that the child existed, that they were loved and will forever be remembered," said Dr. Barb Warner, MD, NICU neonatologist at St. Louis Children’s Hospital. "While there is no replacement, these bears provide a memory, which the families are eternally grateful to have." The Turleys currently have 2,400 bears to give as well as restaurant and fuel gift cards to support families getting to and from doctor's appointments. The couple hopes to expand Catherine's story and the "Catherine Cares" initiative throughout the Midwest. "If Catherine can't be here with us, it's unfortunate. But she's doing a lot of good things," Wayne Turley said.